What to Include on Your Coupons - Flottman Company. When you plan your marketing strategy, don’t overlook the power of coupons. Coupons give potential customers a tangible incentive to look into your inventory and make purchases. According to a report by the Farnsworth Group, 93% of consumers used coupons in 2011, and that number has remained fairly steady. your marketing strategy directly resulted in a purchase. Since coupons are such an important and effective aspect of marketing, you need to make sure your coupons reflect your company well and appeal to the customer. To design an effective coupon, you’ll need to carefully consider what information is necessary and how to best utilize graphics and images. As you start designing a coupon, incorporate some of the following features to increase the effectiveness of your direct-to-consumer marketing strategy. either use a high resolution graphic of the cereal itself or a picture of a smiling family spending time together while enjoying a bowl of cereal. Think about how you want to market your product. Do you want to emphasize a specific aspect of the product, such as its health value, popularity, or cost? Or do you want to focus on how using the product will improve the consumer’s life? In either case, find an image that makes your product look appealing and reflects the values of your company. Consider using a large picture, aligned on either the left or right side and taking up a sizeable amount of space. You want the image to draw the eye without taking attention away from the necessary text. To figure out what kind of deal would benefit you and your customers, think about the specific product or service you want to promote. Consider what deal or discount would draw in new business without damaging your profits. A discount that causes you to lose money is risky since you can’t be sure that customers will buy anything other than the advertised product. You can choose not to give your deal an expiration date to allow customers to purchase the product or service at their convenience, but you may find people coming in years later with a coupon they found somewhere in their home. Expiration dates also mean you have a time frame to go off of when planning your finances. Customers may also be more compelled to use the coupon if they only have a limited amount of time in which to claim the discount. If they only have a couple of days or weeks to redeem the coupon, they will likely plan ahead to purchase the product or service. If they have a longer time frame or no time frame at all, they won’t feel pressured to use the coupon and may forget about it entirely. Clearly explain what is and is not included in the coupon. For instance, you may want the coupon to include any medication from a particular brand, or you may only want the deal to cover the liquid or capsule version. You may also want the coupon to only cover one product instead of as many as the customer wants to purchase at once. Make sure these restrictions are clearly printed and easy to read. Unclear coupons can lead to frustrated customers who are unlikely to continue shopping for your products. Above all, you want your customers satisfied with the deal and their purchase so they keep coming back. This may be self-explanatory and obvious, but make sure that you don’t spend so much time on the information that you forget to include a way for the customer to redeem the coupon. Leave enough space so that the sales clerk can easily scan the coupon or read the numeric code. Try to make the redemption process as simple as possible. Now that you have a coupon crafted to drive business, where do you put it? Consider the traditional options such as newspaper and magazine placements. Then add the new opportunities; have the coupon requested or printed via social media. Use cover labels to place the coupon on the package for instant redemption. 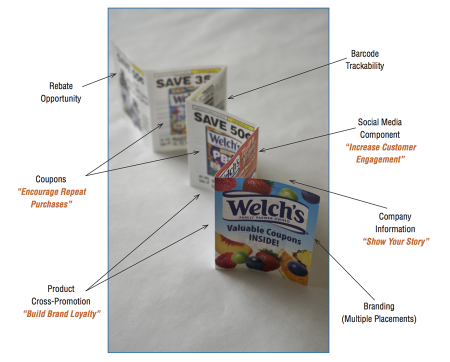 Add the coupon designed within your product packaging to drive repeat sales. Another option and one of our favorites, put the coupon inside your package and market directly to your captive audience. If you want to include coupon inserts as part of your future marketing campaign, talk to Flottman Company. We can help you design, print, and package your coupons. Visit our Flottman Company Facebook page and tell us where you have promoted coupons, your coupon success stories and any additional recommendations to share. Your comments may be the resource for our next blog post.